You can create fee schedules for use with billing services and products. You can attach a fee schedule to a provider, to an insurance plan, to a location in your organization, or to a patient (as a discount plan). Note: Fee schedules are global (available to all locations across your organization), but locations can each have different preferred fee schedules. Providers and insurance carriers can also each have their own preferred fee schedules. However, if you change the fee in a given fee schedule while logged on to any location, not only is the change accessible across the organization, but the procedure code will be updated for the locations that have that fee schedule as their preferred fee schedule. 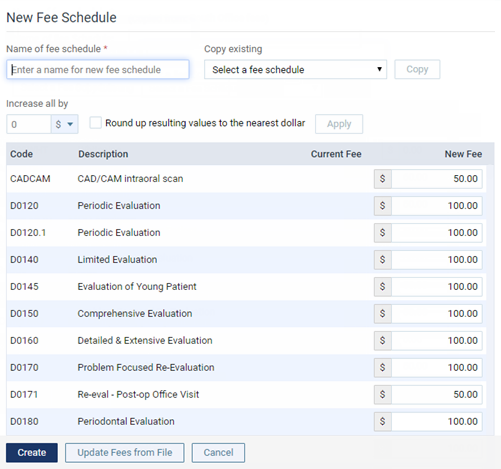 The options for creating a fee schedule become available. In the Name of Fee Schedule field, type a name for the fee schedule. To base this fee schedule on an existing fee schedule, select the fee schedule you want to copy from the Copy Existing list, and then click (or tap) Copy. For each procedure, type or change the fee that you charge as needed.